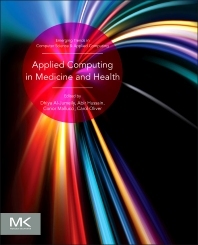 Applied Computing in Medicine and Health is a comprehensive presentation of on-going investigations into current applied computing challenges and advances, with a focus on a particular class of applications, primarily artificial intelligence methods and techniques in medicine and health. Applied computing is the use of practical computer science knowledge to enable use of the latest technology and techniques in a variety of different fields ranging from business to scientific research. One of the most important and relevant areas in applied computing is the use of artificial intelligence (AI) in health and medicine. Artificial intelligence in health and medicine (AIHM) is assuming the challenge of creating and distributing tools that can support medical doctors and specialists in new endeavors. The material included covers a wide variety of interdisciplinary perspectives concerning the theory and practice of applied computing in medicine, human biology, and health care. Particular attention is given to AI-based clinical decision-making, medical knowledge engineering, knowledge-based systems in medical education and research, intelligent medical information systems, intelligent databases, intelligent devices and instruments, medical AI tools, reasoning and metareasoning in medicine, and methodological, philosophical, ethical, and intelligent medical data analysis.